If you’ve followed LGBT news this past summer, you couldn’t avoid hearing buzz about Israel. 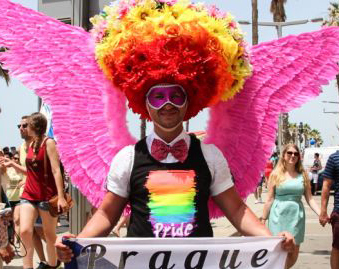 On June 12 in Tel Aviv – the country’s second most populous city and its financial center – well over 150,000 people participated in the annual Pride Parade, a record-breaking number not only for the country but also for the entire Asian continent. This record (which grows substantially from year to year) helps solidify the city’s reputation as one of the Gayest Cities in the World, at least according to popular travel providers and agencies around the world. Then, just a few weeks later and 57 miles inland, the Pride Parade in the city of Jerusalem also captured international attention. Unfortunately it wasn’t for record-breaking attendance this time, but for a shocking attack on six participants. 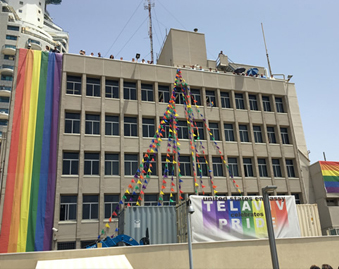 The drastic difference between these two Pride events reflect the complex nature of Israel in general, a situation that stems from the country’s literal position at the crux between the Old World and the New, between the cultures of the East and the West, and within differing religions and faiths that offer a wide spectrum of observence and practice. Oddly enough, I found myself, both physically and figuratively, immersed in that complex environment this summer. I am not Jewish, nor did I previously have any personal connections to Israel. But on June 2, I found myself sitting on a plane heading from Los Angeles to Tel Aviv as one of 25 LGBT leaders visiting the country with A WIDER BRIDGE, an amazing organization that has a mission to connect Israelis and LGBTQ North American leaders and allies.